Haiti is a country which has seen some 35 changes in government, many of them military uprisings, since it was founded as a republic of freed black slaves in 1804. Many Haitians see what has happened to former president Jean-Bertrand Aristide as just another coup. Haiti is a delightful place to work as a journalist. It is wildly exotic, colourful and full of creature comforts. The food is wonderful and the tropical climate perfect. Therein though lie some of the drawbacks of trying to report this country to the world. Take my hotel, the Montana. 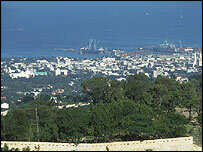 It is very luxurious, high on the hills that surround Port-au-Prince. My room and balcony face west, and I watch the sun sink into the ocean most nights. The dawn is particularly entrancing. The sun eases above the ridge behind and pink light moves across the capital, from the sea inland towards us on the hills. We are far above the fray here, a long way from the plight of the teeming millions below us. I became a journalist originally because, as one of my US muckraking heroes said, I wanted to comfort the afflicted and afflict the comfortable. But here in Haiti, I am one of the comfortable. And my contact with the afflicted? It is sporadic, from behind the windows of a sumptuous sports utility vehicle that cost more than most Haitians will earn in a lifetime. I am one with the Haitian rich, up here on my hilltop, and it is decidedly uncomfortable. It is plain to anyone who studies this place that the Haitian elite have much to account for. They have prospered wildly over the years, as their country has suffered through dictatorship, instability, decline and occasionally, a little unshared economic growth. In the villas that surround my hotel are largely light-skinned people of mixed race who own factories, businesses, import-export concessions, and much of the land that I can see from my balcony. Many of them are descendants of the original French colonisers here - German, Polish and Serbian immigrants and Lebanese, plenty of Lebanese - all members of Haiti's business class. And we journalists live in their midst, eating with them, drinking in their clubs and usually listening to their political opinions. Take Jean-Bertrand Aristide. In my neighbourhood in Haiti he is universally reviled. From the Montana hotel down the John Brown Road, and up to snooty Petionville on a saddle between two high ridges, feelings against the priest from the slums are fierce and viscerally negative. But when, for a couple of hours each day, along with my colleagues from the international media, I venture a few hundred metres down the hill into Port-au-Prince proper, I hear vastly different views. Usually, they are put forcefully and emphasised with a sugar cane cutting knife brandished in my face, sometimes even a gun. Not always though. 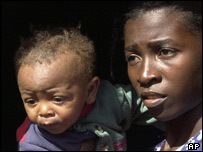 In fact, much of the time the poor of Haiti are calm and seem resigned to their fate. That fate so far has been well-chronicled in its unrelenting misery and recurring disappointment. 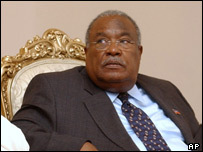 The latest convulsion in Haiti deprived the poor here of a man who once represented hope for development and renewal. 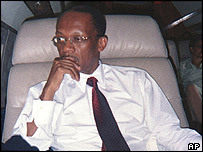 Haiti's poor viewed Aristide as their man and they gave him a lot of scope, and two terms in office. Their lives barely improved in that time, something that isn't entirely Aristide's fault, at least not as the poor see it. This past week, many hundreds of people took to the streets to demonstrate for Aristide's return. When you meet them, they confess to disappointment with his time in office, but they point out that he had two more years and should have finished his term. You get the impression that they would have enjoyed holding him to account themselves, rather than having some ragtag rebel militia they believe was backed by France and the US topple the man they call Titide. He was theirs to punish, or to reward, as they saw fit. Yet again the Haitian rich - Paris and Washington as they see it - had robbed them of a birthright... the right to vote. Most poor Haitians are immensely proud. They are proud that their country was founded 200 years ago in defiance of Paris and Washington. The French under Napoleon bested on the field of battle, expelled from their proudest colony, with the shackles of slavery cast off. The US were horrified at a successful slave rebellion and the implications for its own slave economy. The US did not even recognise Haiti, or allow its merchants to trade with it, until 1868, after the trauma of the American Civil War. Throughout most of the 19th Century, France insisted that Haiti owed the merchants of Paris some 150 million golden Louis - billions in today's money. That was the value of the slaves who had freed themselves, human beings as merchandise. The poor of Haiti can be forgiven for viewing the French and US soldiers who are here to keep the peace with a somewhat sceptical eye. These are the two countries that have long intervened in Haiti, usually say the poor, to prevent good things from happening. As recently as the mid-1990s, the US destroyed Haiti's indigenous rice economy by insisting that trade barriers to cheap US rice be dropped. A country once self-sufficient in rice now has to import almost all of its needs. The Haitian rich benefited from that because they arranged the imports. The poor can only afford rice once in a while now. So from my hilltop eyrie, I look down on the cooking fires of evening, the poor perhaps boiling up their weekly meal of long-grain rice from Louisiana, getting on with their lives. Soon the schools will open again, and the violence may start to fade. Haiti's new Prime Minister, Gerard Latortue, widely seen down below me as a US appointee, is by all accounts a good and well-meaning man. But he will have to work hard to get sea-level support in Port-au-Prince. And so far, I have not seen him doing that. He has the room next to me at the Montana Hotel. We share the same view of his country. His, I hope, changes soon. I know mine already has. From Our Own Correspondent was broadcast on Saturday, 20 March, 2004 at 1130 GMT on BBC Radio 4. Please check the programme schedules for World Service transmission times.